Krista Byers-Heinlein’s research investigates language acquisition and cognitive development, with a focus on bilingualism in infancy. 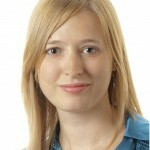 Her research approach is multi-pronged, integrating techniques such as eye tracking, neuroimaging, high amplitude sucking, habituation, preferential looking, and parental report. Her work has two overarching aims: 1) To to inform and extend theories of language acquisition and cognitive development using data from bilingual infants 2) To generate empirical results that can inform the decisions of parents wishing to raise bilingual children.